Event : EA Mechanics partnered up with DEUTZ to penetrate the engine industry and aviation ground handling service. 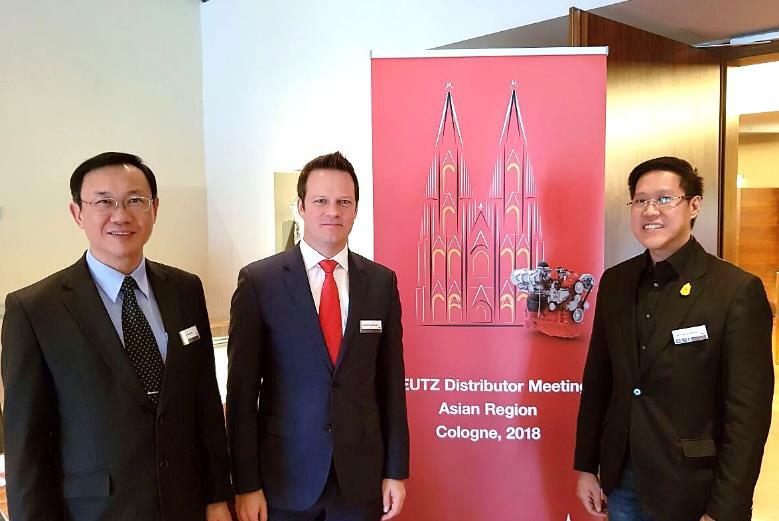 On Wednesday, March 7, 2018, Mr. Aphiwat Wutthinansurasit, Chief Operating Officer, EA Mechanics Co. Ltd. attended the Deutz distributor meeting Asia Region and signed the business partnership agreement to be sole authorized distributor of Deutz engines in Thailand with Mr. Bernd Freudenmann, Managing Director and Mr. Chee Kim Tian, Senior General Manager as the representative from DEUTZ Asia Pacific at Cologne, North Rhine-Westphalia, Germany. The collaboration between DEUTZ and EA Mechanics as sole authorized distributor of DEUTZ engines in Thailand, will be carried out and covered in various segments. We are provide best ranges of diesel engines for e.g. Ground support equipment, Marine, Railway, Agricultural equipment, Automotive, Stationary equipment, Material handling and Construction equipment, including quality genuine parts and expertise aftersales services. EA Mechanics management team is planning to penetrate the engine industry, Ground support equipment (GSE) and services in Thailand and ASEAN countries this year, which accelerated sales and profit continue. With the experience of EA Mechanics Co., Ltd., DEUTZ is confident that EA Mechanics will be able to step into the Thai engine market soon, especially the aviation ground handling industry and agriculture. 154 Years of the legend, DEUTZ was founded in 1864 by N.A. Otto & Cie in Germany as named the first engine manufacturer in the world and the mission to continue to lead in the future when it comes to customer value, quality and technology as well as system and service solutions for the engine. DEUTZ diesel engines provide the power range from 19 to 620 kW, expertise in agricultural business, construction, material handling, and railway and diversified automotive. DEUTZ offers its customers a comprehensive and short-termed support by 13 distribution companies, 7 sales offices and over 800 sales and service partners in more than 130 countries around the world. EA Mechanics Co., Ltd. as the sole authorized distributor of DEUTZ engines in Thailand offering a wide range of engine performance that are well proven by international standard include Ground Support Equipment, Marine, Railway, Agriculture Equipment, Automotive, Stationary Equipment, Material Handling, and Construction Equipment. In addition to the distribution of various types of engines, we also provide genuine parts and services with highly trained skilled technicians and engineers to give the customers the services needed.